Hey all! It's Denise here. 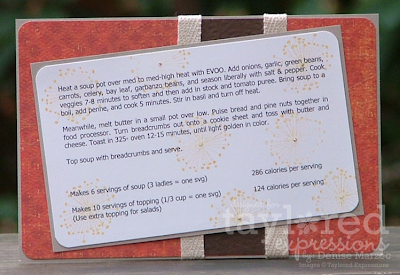 Today I want to show you a 4x6 recipe card I made for some Minestrone soup. It's a REALLY yummy recipe from Rachel Ray (I love her show!). In the fall and winter, soup just tastes better and this one has a great crunchy topping that you can add...a topping of crumbled up bread, pine nuts, and parmesan cheese toasted with butter. Oh yum!! It takes minestrone soup to a whole new level, let me tell ya! I typed up the recipe on my computer and printed it out on Choice Buttercream CS, stamped some images from my Celebrate Life set over the text in Memento Cocoa and So Saffron, and added little dots of Platinum Stickles to the centers of the saffron silhouettes. The rust-colored DP and twill ribbon (the reverse side of the alphabet twill) is from the Places You'll Go Key Ingredients Kit. I put my recipe cards in a binder with clear card protectors (two recipes per sheet) so they don't get messy when I'm cooking, and because I can see both sides through the clear protectors, I make my cards two-sided. I put the title and ingredients on the front of the card, and here's the back with the cooking instructions and calorie info. 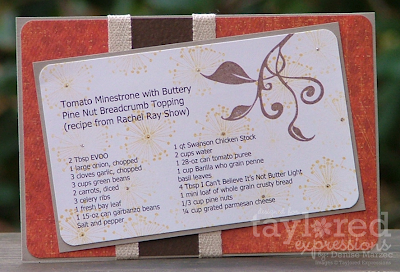 Love this pretty recipe card Denise! I'm glad you keep it safe in a clear binder! I'm not much of a cook - what is EVOO?? sounds yummy - you have the best looking cookbook ever! This is DELISH Denise!! I have to agree with DOnna...you have the best looking cookbook around!